South America is a continent located on Earth which consists of countries such as Ecuador, Suriname, Brazil, Guiana, French Guiana, Colombia, Peru, Argentina, and Chile. It is well known for its tropical climate and rainforests. South America appears in an episode of The Adventures of Super Mario Bros. 3, "7 Continents for 7 Koopas". When Bowser tries to conquer the entire Real World, he puts Hop Koopa under control of South America. Hop uses his magic wand to turn the Amazon Rainforest into a giant parking lot. 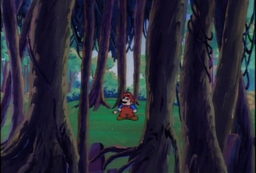 However, Mario later restores the jungle to its natural form by using Hop's own magic wand. Mario & Sonic at the Rio 2016 Olympic Games is located in Rio de Janeiro, host city of the 2016 Summer Olympics. This page was last edited on August 18, 2018, at 13:42.